Good condition per inspection January 14, 2013. 6 year old Full Sunbrella boat cover for winter and summer when not in use. Decks removed in 2002 and fully fiberglassed topside, repainted with sterling paint. Mast all new wires, painted sterling, and upgraded Garmin GPS Map 3010C and radar set-up and Garmin GSD10 sounder. 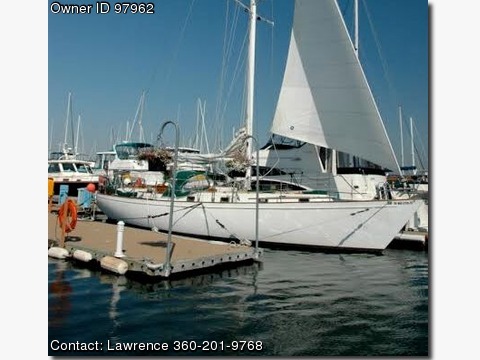 Roughly 2300 hrs on Lehman diesel engine, transmission reconditioned in 2006, compass, dockside power, Xantex inverter, 2 heads, 2 showers, galley, refrigerator, storage, 3 sails, 8 new 2011 batteries, diesel cabin heater, teak flooring & cabinets, cedar lined closet, custom beds, sleeps 6, 300 ft. chain anchor rode with 2006 LaGrange windlass, 6 winches, VHF, new coast guard approved, new 2013 42 gallon starboard fuel tank, new 2014 bottom paint, new 2014 survey, rigged for single handed sailing, prof. maintained, slip is available.